( Newton, NC - - September 6, 2010 ) It was the perfect weekend to remember a fallen legend of Hickory Motor Speedway's past. This Labor Day weekend marked the 34 th Annual Bad Boy Mowers Bobby Isaac Memorial honoring Isaac with a spectacular two day show. The event roared to life Sunday afternoon with practice and qualifying for all divisions along with 25-lap features for the Tarheel Vintage Cars, the East Coast Flatheads and the Legend cars. The action continued on Monday as the Late Model Stocks took to the track for a 150-lap feature along with a 50-lap race for the Limited Late Models and a second 25-lap race for the Legend cars. 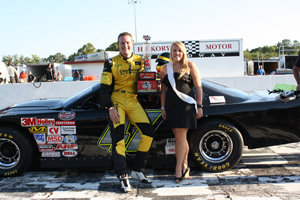 Australian native George Miedecke found great success at the historic short track in his Fat Head Racing Chevrolet, as he captured his first Late Model Stock Car win at Hickory Motor Speedway. 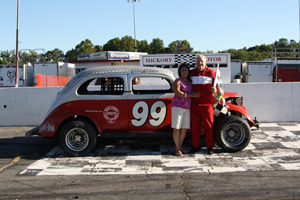 The Tarheel Vintage cars kicked off the event with a 25-lap event on Sunday, with the No. 12 of Johnny Gregory on the pole. It didn't take long for Gregory and the No. 16 of Bill Webb to run away from the field as they created a half lap lead over their competitors by lap three. On lap three the No. 90 of Dennis Henke moved into the third place position after a tight side by side batter with the No. 97 of James Ritchy. The No. 5 of Ron Walker worked his way into the top five within the first five laps after starting in the sixth place spot. With ten laps remaining the No. 66 of Richard Pridemore began to put pressure on Ritchy for the third place spot capturing the position on lap 18. The first and only caution flew on lap 22 when Pridemore made contact with Gregory as they headed into turn one, sending Gregory for a spin. Gregory made his way back out front at the restart but would have to settle for a second place finish coming in behind Webb. Pridemore, Ritchy and Walker completed the top five. 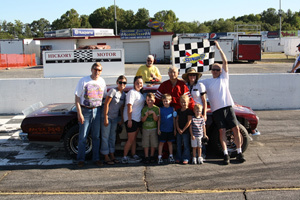 The East Coast Flathead ventured out on the historic 3/8 mile short track for their 25-lap event with the No. 99 of Johnny Johnson leading the way. The first caution fell early after the No. 18 Rosie George came to a stall on the back stretch. It was smooth sailing for the competitors in the East Coast Flatheads until lap 21 when the No. 6A of Rhonda McKnight mechanical issues bringing out the second and final caution. Johnson would lead all 25-laps as he brought the field to the checkers with the No. 4 of Kenneth Tuttle, the No. 31 of Clayton Smith, the No. 00 of Jim Brock and the No. 19 of Jerry Tuttle in tow to round out the top five. The Legend cars hit the track for their first of two 25-laps this weekend. The No. 99 of Jake Morris qualified in the pole position and brought the six car field to the green flag. The No. 95 of Josh Morris managed to fall in behind his teammate Jake moving into the second place position early on after starting third. The drivers kept the action rolling until lap 19 as the ride of Josh Morris caught fire as he exited turn four, bringing out the first and only caution of the event. Jake Morris would wheel his ride to the checkers after leading all 25-laps of the event. The No. 10 of RS Senter, the No. 88 of Ed Harwell, the No. 9 of Gene Traxler and Josh Morris completing the top five. The second day of the Bad Boy Mowers Bobby Isaac Memorial kicked off with 50-lap Limited Late Model race. The No. 51 of 2009 Hickory Motor Speedway Street Stock Champion, Waylon Flynn brought the 13 car field to green flag. The No. 16 of Dexter Canipe Jr. may not have brought out his usual No. 5 black and orange ride to the race, but that didn't stop him as he jumped into the lead on the first lap. The first caution of the event fell on lap three after the No. 6 of Brandon Hudnall went for a spin on the exit of turn two. Hudnall found himself involved in the second caution as well after connecting with the No. 13 of Dakota Slagle and going for a spin as the two came out of turn three on lap eight. Flynn had worked his way back into the lead by lap 17, leaving Canipe Jr. to fall back into second. Canipe Jr. slowly fell off the pace falling back to fourth after being passed by the No. 07 of Tyler Church on lap 20 for second and the No. 12m of Austin McDaniel on lap 28 for third. On lap 32 Hudnall spun around again as he headed down the front stretch, bringing out caution number three. The fourth caution waved on lap 35 after the No. 15 of Sheflon Clay and Slagle connected heading into turn one, sending Clay spinning. The No. 21 of Monty Cox also spun around trying to avoid making contact with the parked rides of Clay and Slagle. The drivers marched on until lap 38 when McDaniel and Flynn touched coming out of turn two causing Flynn to back out of the throttle. Church had nowhere to go and found himself in the back of Flynn, sending Flynn around. The incident brought out the fifth caution of the 50-lap event. The No. 12 of AnnaBeth Barnes was on a roll as she made her way into the top three by lap 44. A sixth caution fell on lap 46 after Hudnall spun around for the fourth time heading out of turn two. The seventh and final caution came out as the field went back to green flag racing when McDaniel missed a shift on the restart causing a chain reaction of cars to bunch up. It looked as though all drivers would hold on, but as the field headed down the back stretch cars got sideways and headed towards the outside wall. The No. 26 of Joey Herques, Church, Slagle, the No. 66 of Travis Byrd, Barnes, the No. 11 of Matt Piercy and McDaniel were all involved in the incident, putting all but Byrd, Piercy and McDaniel out of the race. The red flag was brought out as track officials and safety crew assessed the damage. The race came down to a four lap shootout with only seven cars remaining on the lead lap. Canipe Jr. jumped out front at the restart and pulled away from the field driving to the checkers with the No. 8 of Mark McIntosh, McDaniel, Piercy and Clay following behind rounding out the top five. The Late Model Stocks took to the track for the 150-lap feature event with the No. 47 of Australian native George Miedecke in the pole position. The front of the field quickly spread out during the first few laps of the feature as drivers battled to break into the top five in hopes of capturing the prestigious win. The No. 4 of Jessica Brunelli made her way into the fourth place position by lap five after starting in the sixth place spot. The No. 57 of Grant Wimbish was on the move breaking into the top five by lap ten. The first caution waved on lap 18 after the No. 06 of Brad Cox went for a spin on the exit of turn four. The No. 92 of Candace Muzny and the No. 7 of Ashley Huffman maintained a tight battle during the early laps as the two swapped the second place position back and forth with Muzny running away with the spot on lap 30. Meanwhile the No. 19 of Kyle Moon continued to work his way towards the front moving into the top five after the restart. Moon broke into the top three on lap 42 and then set his sights for Muzny, until the second caution fell after Brunelli and the No. 11 of Robert Johnson made contact coming out of turn four sending Brunnelli around on the front stretch. Wimbish received minor damage trying to avoid the wreck that would end up putting Johnson out of the race. The No. 32 of Kyle Grissom made an appearance in the top five after the restart, hoping for a chance to move out front and take over the lead. On lap 66, Brunnelli and the No. 54 of Kaleb Pressley would collide heading out of turn four sending Brunnelli around for a second time on the front stretch collecting Cox, calling for caution number three to wave. The restart put Moon in prime position to continue his way towards the front moving into second on lap 73, pushing Muzny into third. 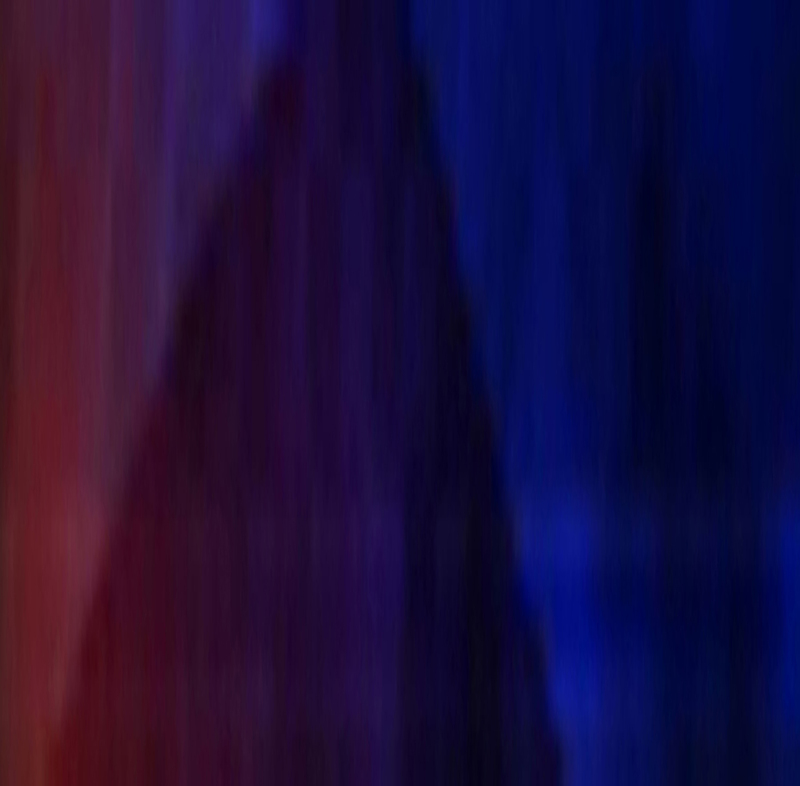 By the mid-point of the race the No. 43 of Jesse LeFevers had patiently worked his way into the top five hoping to gain ground as the laps wound down. On lap 92, Grissom had pulled under Muzny to take over the third place position, leaving Muzny to ride around fourth until the fourth caution came out on lap 132 after the second place runner (Moon) cut a tire. Miedecke and Grissom were lined up side by side on lap 137 to restart the feature for the final 13 laps. As the field went back to green flag racing the fifth and final caution fell as race officials determined Grissom jumped the restart. Grissom knew the pressure was on if he hoped to capture a win as he battled Miedecke for the top spot. Grissom was able to take over the position on lap 139, but Grissom's lead wouldn't last look as Miedecke moved back out front on lap 140. Muzny was on a run during the final laps as she regained the second place position with only nine laps to go. 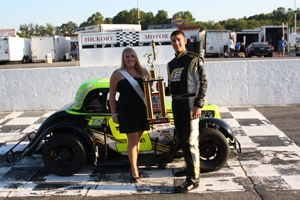 With the final lap quickly approaching Miedecke continued to inch away from the field grabbing the checkers and his first win at Hickory Motor Speedway. “With the history that Hickory (Motor Speedway) has, it's great to get a win here,” Miedecke announced from Victory Lane. Muzny, Grissom, LeFevers and Wimbish rounded out the top five. The Legend cars brought the 34 th Annual Bad Boy Mowers Bobby Isaac Memorial to close with their second of two 25-lap events. The No. 99 of Jake Morris brought the 15 car field to the green in the pole position. The cars cruised around the track for 25 caution free laps as the No. 8 of John Hilliker worked his way into the fourth place spot within the first ten laps after starting in the ninth place position. Hilliker continued to move towards the front taking over third on lap 19. Morris not only brought the field to the green, but he brought them to the checkers taking home his second win of the weekend. The No. 95 of Josh Morris followed behind in second, with Hilliker in third. The No. 2 of Matt Drake came home fourth after starting sixth, and the No. 13 of Brian Quimette concluded the top five after starting the race in the twelfth position. The NASCAR Whelen All-American Series is back on Saturday, September 11 th as Steele Rubber Products presents Ruckus House Night. The night will feature the Bojangles Late Models, the Everything Attachment Super Trucks, the Hickory Street Stocks, the Hickory 4-Cylinders, the Red Baron Race Parts Hobby Stocks and twin 25-lap features for the Advance Auto Parts Limiteds. Grandstands open at 5 PM with qualifying immediately following. Fans will have the opportunity to meet Muhsin Muhammad from the Carolina Panthers, pro-wrestler Ricky Nelson from the Rock N Roll Express along with some of their favorite HMS drivers during the 6 PM autograph session. Racing action will begin at 7 PM. Tickets are only $10 for adults, $8 for teens and seniors, $5 for kids 7-12, with kids 6 and under free! 1 (16) Dexter Canipe Jr.